Visiting one of the largest palaces in the world sounds pretty intimidating and probably a tad exhausting. If your visit is well planned, however, with plenty of breaks for lunch and coffees, half a day (or even a day) spent wandering the Château de Versailles and its exquisite gardens are well worth the day trip from Paris. Read on to learn how to get to Versailles from Paris as well as how to visit Versailles like a local! Read until the end of this informative article and you will get some bonus facts from Jonathan, a Localers tour guide who runs the Versailles tour! By Train: The RER is the suburban train that connects central Paris to its hinterland. You should take RER line C towards Château de Versailles Rive Gauche. You will buy a train ticket at any of the stations in Paris where the RER C passes (for example Saint-Michel, Musée d’Orsay, Invalides) for Versailles Rive Gauche. It’s a good idea to buy a return ticket as well as you can use it at any time in the day. The price for a ticket one-way is 3.55€. The trip to Versailles should take about 30 minutes. By Coach: Versailles Express proposes trips from the Eiffel Tower direct to Versailles. The service runs from Tuesday to Sunday with two departures per day. 8am (Return 12pm) or 2pm (Return 6pm). By Car: Take the A13 Motorway and take the exit for Versailles Centre. A car park is available at the Place D’Armes, Allée Bailly, Grand Trianon, and Petit Trianon. Versailles Palace and Gardens are beautiful all year round, but each season has its advantages. Although the Palace is more crowded during the summer months and on weekends, you will be able to enjoy the wonderful Grandes Eaux Fountain Show in the Gardens during this time. Aside from the Christmas period, Versailles tends to be quieter during the winter months (from November to March). Throughout the year, arriving in the morning or mid-afternoon will mean you should be able to avoid the busiest period, which is between 11am-3pm. From 1st April to 31st October, the Palace is open every day except Monday from 9am to 6.30pm. Last admission to the Palace is 6pm. From 1st November – 31st March the Palace is open every day except Monday from 9am to 5.30pm. Last admission to the Palace is 4.45pm. The Palace is closed Mondays. Open every day from 8 am to 8:30 pm. Open every day except Monday from 12 pm to 6:30 pm. Last admission is at 6 pm. Since the Louvre is closed on Tuesdays, many tourists will rush to Versailles on Tuesdays! For more useful travel tips to this historic city, check out our Versailles Map where we not only show where to find the best attractions, we also share what the best restaurants in Versailles France are! 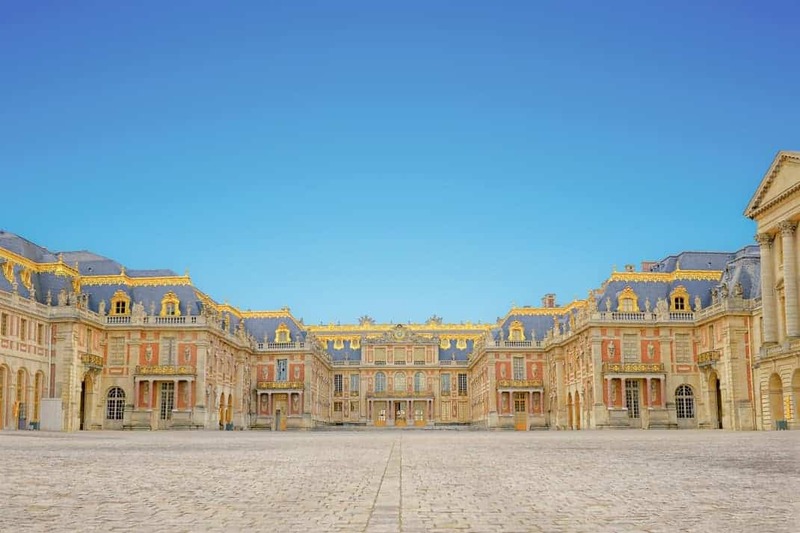 The important thing to remember about Versailles is that you can visit the Palace in the span of a few hours but you will need to extend that timeframe if you want to visit the extensive Gardens and the other domains in the grounds of Versailles such as Marie Antoinette’s domain or the Petit and Grand Trianon. It’s worth your while taking a whole day to really explore the gardens and the other palaces that are found therein. For foodie tips for your day to Versailles, read our article about where to eat in Versailles. Skip-the-line tickets are available if you are taking a tour and you book this in advance, such as a tour with Localers. It is a must-have to visit Versailles in the best conditions. With the Palace of Versailles being one of the most visited sights in France, it can have queues of over 2 hours without these tickets. And only for INSIDR travelers benefit from 10% off your online – purchase by using the discount code “INSIDR”. While you should definitely visit the famous Palace and gardens, you may wish to bypass the main palace at first and head directly to Marie Antoinette’s personal country village where she dressed as a maid and milked cows. Or you may want to discover the pared-down elegance of the Petit Trianon and Trianon Palaces. These are all accessible by passing through the palace at the Grille d’Honneur gate, or via the Queen’s gate or Saint-Antoine gate. After deciding the world of retail was not for him, Jonathan pursued studies in art history, later deciding to use his skills in English and his encyclopedic knowledge of French history to run guided tours in Paris. One of Jonathan’s specialties is his small group guided tour of Versailles, so as a bonus feature to this article about visiting Versailles, INSIDR picked Jonathan’s brains to find some fun facts about the famous Palace. – Have you ever wondered why there are so many orange trees in the Versailles gardens? They were planted to provide the orange blossom for the Sun King’s perfume. The King could only tolerate the delicately airy scent of orange blossom, so he and all his court wore the perfume created from the trees you see at Versailles. – Versailles is BIG! There are 2,300 rooms and 1315 fireplaces. – People died during the construction of Versailles, surprisingly, however, many of the deaths were the result of a disease caused by working in swampy conditions, as Versailles (believe it or not) is built on ancient disease-infested swamps! – Louis XIV, also known as the Sun King, was an absolute monarch. He formalized a whole court etiquette to ensure he was perceived as having unrestricted authority. One of the formalities was the levée ceremony which involved the full court attending the King’s bedchamber to witness the king rise and be dressed in the morning! Can you imagine! INSIDR has collaborated with Localers to bring you this article. Localers is a tour guide company providing unique and interesting tours to help you visit Paris, including an excellent tour of Versailles! And only for INSIDR travelers benefit from 10% off your online – purchase by using the discount code “INSIDR”.